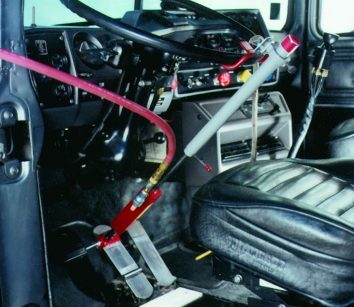 Now you can stop the vehicle your heavy-duty tow truck is towing by simply attaching the Brake Buddy to the brake pedal of the vehicle in tow. When you apply the brakes, the air hoses from your heavy-duty tow truck engage the brakes of the vehicle you are towing. Yes, it is simple and it works. Brake Buddy extends the life of your brakes, reduces accidents and helps you stop in a shorter distance. Now available in stainless steel. Call 609-737-2958.